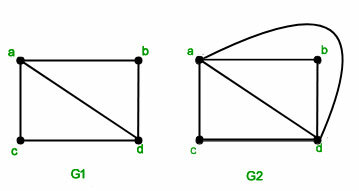 Certain graph problems deal with finding a path between two vertices such that each edge is traversed exactly once, or finding a path between two vertices while visiting each vertex exactly once. These paths are better known as Euler path and Hamiltonian path. The Euler path problem was first proposed in the 1700’s. An Euler path is a path that uses every edge of a graph exactly once. An Euler path starts and ends at different vertices. An Euler circuit starts and ends at the same vertex. There are simple criteria for determining whether a multigraph has a Euler path or a Euler circuit. For any multigraph to have a Euler circuit, all the degrees of the vertices must be even. Proof of the above statement is that every time a circuit passes through a vertex, it adds twice to its degree. Since it is a circuit, it starts and ends at the same vertex, which makes it contribute one degree when the circuit starts and one when it ends. In this way, every vertex has an even degree. 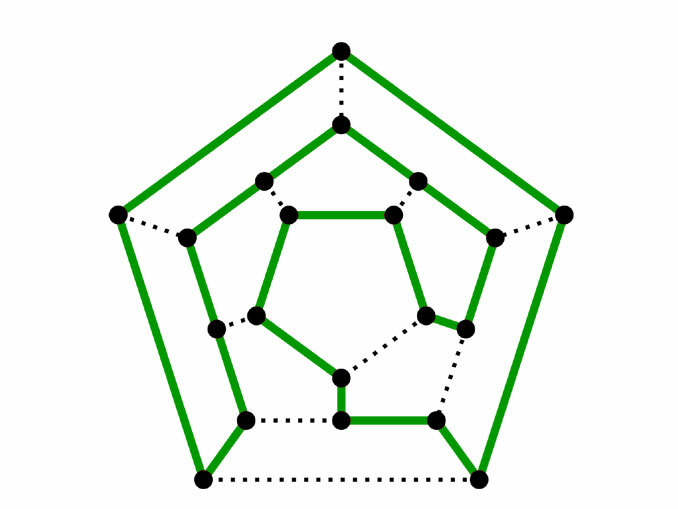 Since the Koningsberg graph has vertices having odd degrees, a Euler circuit does not exist in the graph. The proof is an extension of the proof given above. Since a path may start and end at different vertices, the vertices where the path starts and ends are allowed to have odd degrees. Example – Which graphs shown below have an Euler path or Euler circuit? Solution – has two vertices of odd degree and and the rest of them have even degree. So this graph has an Euler path but not an Euler circuit. The path starts and ends at the vertices of odd degree. The path is- . 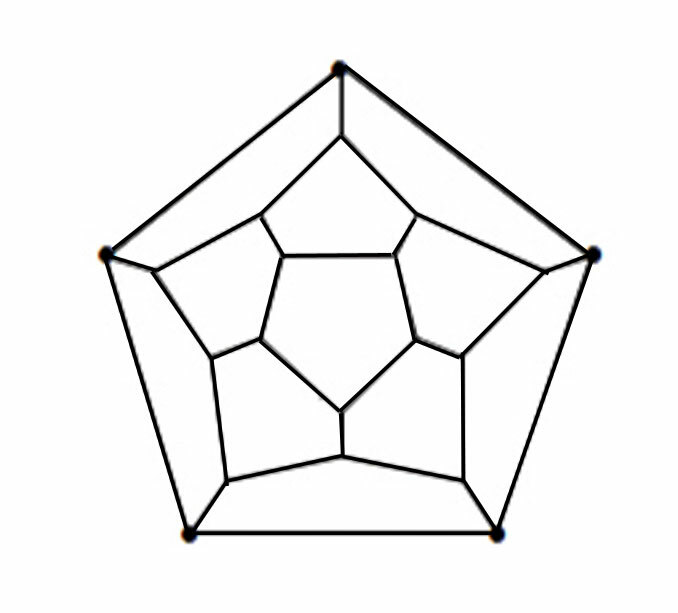 has four vertices all of even degree, so it has a Euler circuit. The circuit is – . Hamilonian Path – A simple path in a graph that passes through every vertex exactly once is called a Hamiltonian path. Hamilonian Circuit – A simple circuit in a graph that passes through every vertex exactly once is called a Hamiltonian circuit. 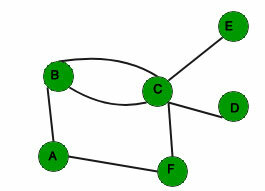 Unlike Euler paths and circuits, there is no simple necessary and sufficient criteria to determine if there are any Hamiltonian paths or circuits in a graph. But there are certain criteria which rule out the existence of a Hamiltonian circuit in a graph, such as- if there is a vertex of degree one in a graph then it is impossible for it to have a Hamiltonian circuit. 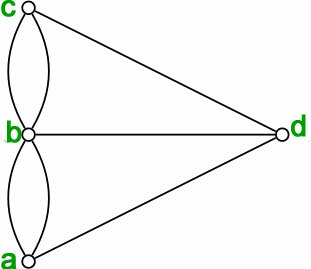 There are certain theorems which give sufficient but not necessary conditions for the existence of Hamiltonian graphs. As mentioned above that the above theorems are sufficient but not necessary conditions for the existence of a Hamiltonian circuit in a graph, there are certain graphs which have a Hamiltonian circuit but do not follow the conditions in the above-mentioned theorem. For example, the cycle has a Hamiltonian circuit but does not follow the theorems. There are many practical problems which can be solved by finding the optimal Hamiltonian circuit. One such problem is the Travelling Salesman Problem which asks for the shortest route through a set of cities. Example 1- Does the following graph have a Hamiltonian Circuit? Example 2- Does the following graph have a Hamiltonian Circuit? Solution- No the above graph does not have a Hamiltonian circuit as there are two vertices with degree one in the graph.